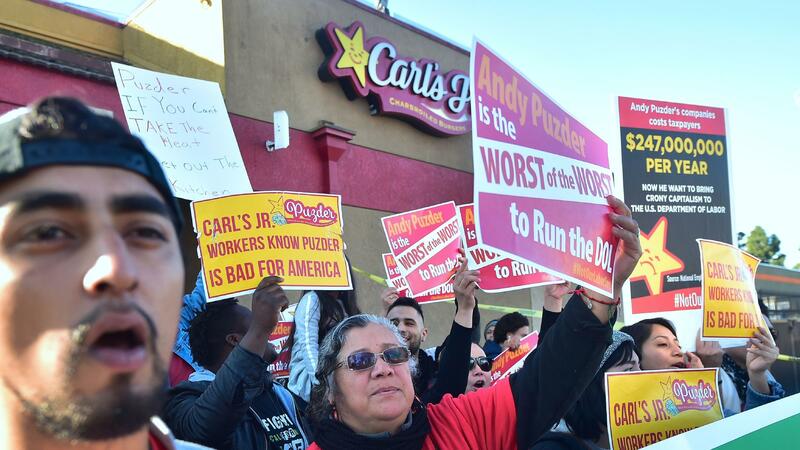 Fast-food workers in Los Angeles on Thursday protest against restaurant-chain mogul Andrew Puzder, who has been tapped as President Donald Trump's nominee for labor secretary. President Trump's nominee to be the next Labor secretary, Andrew Puzder, runs a fast-food empire. Now, as he awaits his confirmation hearings, current and former workers of CKE Restaurants — which operates chains like Carl's Jr. and Hardee's — are filing complaints alleging employment-law violations at his company. Ceatana Cardona says she was sexually harassed by her shift manager when she worked nights as a cashier at a Hardee's in Tampa, Fla.
"When I was one-and-a-half months pregnant with my youngest child, he asked me for a kiss. I refused and began to walk away, but he grabbed me by the collar and, inches from my face, said, 'If you don't give me what I want, I'm going to start taking it from you," Cardona says. Cardona says after she complained to another supervisor, she was given fewer, less desirable hours. She eventually left. Now, Cardona is filing a sexual harassment claim with the Equal Employment Opportunity Commission in Washington, D.C. She's one of 33 workers filing complaints so far this year that detail allegations of wage theft, harassment and discrimination at CKE Restaurants and its franchises. Cardona ultimately blames Puzder. "I'm holding him accountable for the harassment I experienced," she says. But the industry stands behind its man. Puzder joined CKE Restaurants in the 1990s and is credited with helping to guide the company through financially troubled times. He assumed the CEO job in 2000. In a statement, the National Restaurant Association defended Puzder's business record, saying the unions publicizing the workers' complaints are misrepresenting his record. The trade association cited a recent survey showing 92 percent of employees at CKE called it a "good place to work." But the nominee finds himself defending his outspoken objection to minimum wage increases, his calls for automation in the workplace, and his company's record with regulators. Washington Democrat Patty Murray, the ranking member of the Senate committee holding Puzder's hearing, criticized him for not submitting required paperwork. Cathy Ruckelshaus, litigation director for the National Employment Law Project, says that over the past decade, more than half of the investigations into CKE's labor and workplace safety practices have found violations. "The U.S. Senate has all the reason it needs to reject this nomination and demand a labor secretary who will look out for working Americans, instead of one who looks for ways to keep them down," Ruckelshaus says. CKE Restaurants did not immediately respond to requests for comment.